The world is plugged in, and data now drives almost every industry imaginable. From determining the optimum time to change the breaks on a train to figuring out when to throw a fastball versus a curveball; data and analytics are changing the way we do everything. Agriculture, while a little late to the party, is quickly embracing the incredible increases in productivity that can be gained via a deep understanding of the data behind farming, and controlled environment agriculture, in particular, has a lot to gain. From MIT’s OpenAg laboratory1 to Microsoft’s FarmBeats2 initiative, some of the world’s brightest minds are working hard to figure out how big data, advanced analytics, machine learning, and the internet-of-things can be put to use to help supercharge our ability to grow plants and food. At the heart of that effort is a realization that our resources are quickly shrinking while our demand for food is ceaseless, but the science and technology don’t only apply to large scale food farming, and even the smallest home grow-op stands to benefit. At its core, data collection and analytics is all about helping us figure out the minutiae of a task so that we can hone our efforts on a level of detail unimaginable even a few decades ago. We know plants need sunlight, water, nutrients, and carbine dioxide to grow, but how much of each do they need to grow optimally? Previously, we could only make rough guesses based mostly on hundreds of years of trial and error. But with the emergence of big data, we can now determine exact quantities and then automate systems to create ideal growing conditions, even on a plant to plant basis. For instance, we now know that by finely tuning the wavelength of light a plant is exposed to, we can alter its growth for both better yields and different qualities and even tastes3. The right mix of red, green, and blue light can alter things like the size, shape, and color of leaves. Likewise, growth cycles, yields, and quality all respond to changes in water, soil conditions, and atmosphere as well, and each can be dialed in perfectly – assuming the right mix is known. The result is that growers can safely – and naturally – engineer their crops to grow larger, better, and faster, enabling them to get more out of each planting and to turn their space over quicker for the next set of crops. While this kind of data-driven growth engineering can work in outdoor crops, the fact that they’re exposed to mother nature and slaves to her whims reduces the effectiveness slightly. But for controlled environment agriculture like greenhouses and indoor vertical farms, this analytics-based approach to growing is a game-changer. The first step in data-driven agriculture is to actually collect the data, and as with all analytics, the more data points collected, the better. Data is gathered through environmental sensors that measure things like light levels, temperature, soil acidity, humidity, CO2 levels, water quality, and more. Growlink’s Smart Sense sensor suite even offers high-resolution imagery to enable computer vision systems to monitor a plant's external appearance. Data on its own is useless, so once the data stream is flowing, it needs to be processed. Systems like Growlink’s new Plant Health AI ingest the steady stream of data provided by sensors and analyze it, comparing it to historical information, known baselines, and data points from other network-connected systems. Machine learning and artificial intelligence then turn the raw data into useable agricultural intelligence, providing growers with valuable feedback on how their crops could be better served. The cloud-based machine learning aspect means that the system trains itself to anticipate changes or problems based on the current environmental condition in a crop, so that the longer the system is active, the better it gets at providing feedback and making predictions. Depending on the size of the operation, some growers will choose to fully or partially automate the control of their indoor systems, letting the data collected from their crops dictate watering, light intensity and duration, CO2 levels, pest control, and more. Full automation can be cost-prohibitive for smaller home growers, but for larger operations, the improvement in yields from letting the system constantly fine-tune environmental conditions makes the cost of setting things up more than worthwhile. Full-featured automation units like the Growlink One controller can automate every aspect of a controlled environment, from HVAC, to nutrient injection systems, to pH, heating and cooling, and much more. 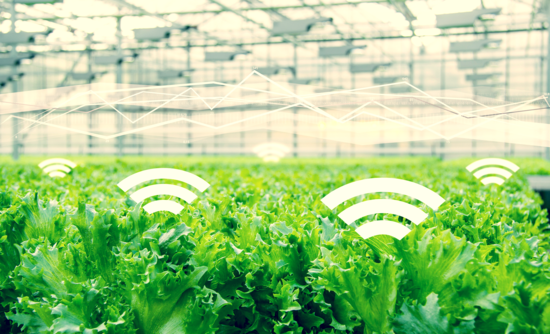 Agrilyst’s 2016 “State of Indoor Farming” report found that only 54% of indoor farmers had sensor-enabled climate control systems in place, and of those, only 75% were connected to the internet4. That means almost half of all indoor farms could still be benefiting from at least some level of analytics. The same report estimated that over the next five years, the indoor agriculture market will grow to anywhere from 3.7 billion to 6.8 billion dollars. With that kind of money at stake, indoor growers simply can’t afford to ignore the benefits that these new data-driven solutions represent. Data is changing every aspect of our daily lives, and machine learning and artificial intelligence are now at a point where they’re arguably more capable than humans at performing certain tasks. Optimizing crop growth is likely one of them, and by embracing the data-age of farming, growers can stop working harder and instead let their systems work smarter, enjoying the healthy yields and profitable crops that come as a result.